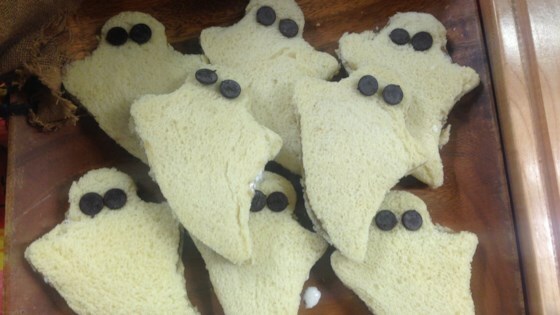 "You can turn any sandwich into a little ghost - if you want to stick with white, use cream cheese, but I usually make PB&J sandwiches for my kids." Toast bread and spread peanut butter on one of the bread slices and jelly on the other. Sandwich the 2 bread slices together. Cut out a ghost shape with a large cookie cutter. Place 2 chocolate chips on the sandwich for the eyes.